"Big Man" takes over the KBS2 Mon & Tue 21:55 time slot previously occupied by "Beyond the Clouds" and followed by "Lovers of Music" June, 2014. Rachel Dec 28 2018 2:07 pm Nice and addictive drama. Kudos for the lead actor for his great performance. Arihant Jun 25 2017 2:08 am I have just completed Ep 6 but this is a winner so far. I had hesitated about watching this due to the low ratings for a long time. But then came across this as a show Jung So min acted in (really liking her in Father is strange) and wanted to check this out.What awaited me was a pleasant surprise -a plot which was actually fresh, ideas that were new (much credit goes to the writer) ,actors who are perfectly cast. TK May 11 2015 11:16 am Such a good drama with interesting leads, good acting. except the basis was weak IMO The highlight for me was So Min and Ji Hwan's interactions. I wish they had ended up together, their chemistry was great and I liked the idea of how Jin Ah fell for him. Ji Hwan and Da Hee's character pairing didn't work for me at all because their roles-pairing seemed very typical. Wanna see Ji Hwan x So Min pairing in a drama in future. Another highlight was Choi Daniel's acting. He really was on the spot with his "always smiling but totally psycho" role. He acted really well. And I do not agree with people hating on Lee Da Hee's acting, her role required that type of acting. She's not a versatile actress I agree but she works well in this type of role and she worked well here. Although I did not like inconsistency with her character, like one moment she was in love with Dong Suk (enough to try to kill a guy for him) and another moment she was falling for Ji Hyuk. JC Feb 26 2015 10:38 am I really liked Jung So Min's character, totally became a fan of hers. I wanted things to work out for Jin Ah and Kim Ji Hyeok, they would have made an interesting couple. Gotta give it up for Daniel Choi too, his villain character was just amazing, he really creeped me out at times. Ba Da Dec 16 2014 4:37 pm Just love how JSM portraited Jin Ah. I thought she was amazing. I love how colorful and crazy this character is and she made this drama very exciting to watch. Keep it up. Can't wait to see So Min in another drama. Noir Sep 28 2014 5:55 am I can't help myself but to keep watching it, the plot are not twist neither awesome just somehow it had me glued! nor Sep 27 2014 3:32 pm Kang Ji Hwan is an excellent actor . i really thank everyone for working this an amazing drama . i enjoyed watching it. edith Aug 03 2014 7:52 pm I really really love this movie, i like the performance of Kang Ji-Hwan, he is a great actor.. i love him very much. i hope and still waiting for his new drama movie. Zango Aug 03 2014 2:00 pm Daniel Choi has excellent performance in this drama, so handsome, so hot, so evil, my bad boy. But truly, I think this drama content is quite ridiculous and silly. I tried as for DC, but have to drop from Ep 10. Mimzie Aug 02 2014 3:21 pm One of the best dramas I've watched recently. If you look at it, it's nothing special but it kept me watching the whole time. Very impressed with Daniel Choi's acting, even though I hated his character because he was so evil, this is definitely the most outstanding acting performance in the drama. Thara Jun 28 2014 11:07 am I really like the first 8 episodes of this drama but for the latter parts i guess the tempo drops and i find it boring. Overall, it is a nice drama. aki Jun 26 2014 1:36 am this is the best movie that i ever see in my life. actors and actresses are so good. and it fun too. u guys should watch this.i am definately sure u gonna like this. Amna Jun 25 2014 6:11 am (i really learned a good lesson from '' big man '' that never give up no matter what even if you were weak like your not studied or something like that there is still power inside you and you may glow it . such an awesome characters really after each person had finished watching will have this feeling always climb and climb till you reach your dream day and make it come true even if it take you too long remember..
ixtyjjang Jun 22 2014 4:38 am I didn't know this was shorten with 4 episodes off. That's why I feel like episode 16's start was kinda weird and I saw "마지막희" and wonder if it was just a mistake. But no, haha it ended with just that. It doesn't feel like the ending was dragged but it feels lacking and looks like it was a lazy ending. ixtyjjang Jun 22 2014 4:35 am I didn't know this was shorten with 4 episodes off. That's why I feel like episode 16's start was kinda weird and I saw "마지막희" and wonder if it was just a mistake. But no, haha it ended with just that. It doesn't feel like the ending was dragged but it feels lacking and looks like it was a lazy ending. Brynn Muir Jun 21 2014 1:22 am Greatly enjoyed this drama, but was severely disappointed in the decision to shorten it by four episodes. I think the decision was a fatal mistake. rskdrama Jun 20 2014 8:08 pm I agree with others. 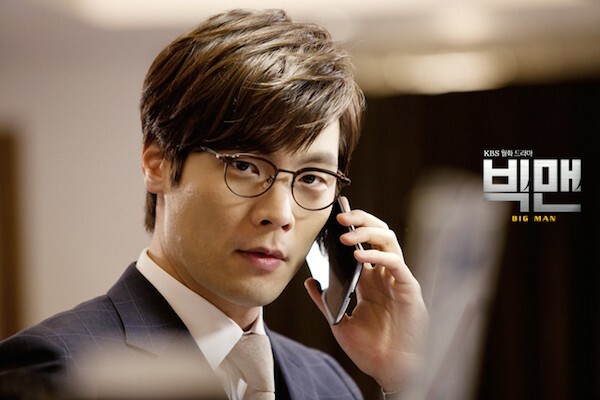 Choi Daniel is the best actor in this drama. At just 28 years, he is so much better than a lot of lead actors in Korean dramas. CICI Jun 20 2014 6:39 pm No matter what happened in "Big Man", Daniel Choi rocked on in the best performance I think he's ever done. Now I'm ready to see him do it again. I hope he's already cast as the lead in a new Kdrama and I WILL be there! Jerry Jun 19 2014 9:43 am This Drama has Been cut 4 episode from 20 to 16 due busy schedule and upcoming World Cup .. And then .. all story in the end seems forced ..
moni Jun 17 2014 7:04 am I think if jung so min was the lead actress ,this drama could have more rating ,just becuse she isn't the lead actress The rating in this drama droop . rskdrama Jun 16 2014 4:25 pm @ or K - completely agree with you. Somewhere around ep 8 the writer just lost it. Now all that they want is drag it till ep 20 with some or the other thing thrown in the story. If not for those small few mins of Jung So Min, I wouldn't watch this drama either. Lee Da hee may be the lead, but she is just nothing, she could just be absent and still the writer could just find any small spicy interlude to drag this drama. lovely girl Jun 16 2014 4:09 am Jung so min !!! Jung so min !!!! She is the best actress en this drama . I love her so much ,her cute face and lovely eyes . hamed Jun 14 2014 6:23 pm Jung so min so good actress ,she make this drama haven more good drama ,i see this drama just becuse of this girl .love you jung so min and stay natural beauty like alwas . mosa Jun 12 2014 3:40 pm The are alot alot comment about actress jung so min and she isn't haven the lead actress, lee da hee most feel bad about that . I also thint that jung so min shold lead this drama becous alot people wach this series for her . She is good actress with natural beauy without plastic face ,tha way i love this actress so much . or_k Jun 12 2014 7:05 am story is a little weird, like something is missing,first something happens and you think it's important case that will be used for continue of story but then you see it has nothing with story. like something has happened and make writer to change or cut that part,kind of fragmentation and inconsistency in script that make you confused!!! for example 95% DNA compatibility in first and then say it's fake,reporter at first and then nothing about them and marketplace's people are okay today and tomorrow all of them have problem but they don't go to police ,dong suk seems a good boy and a person that Mi ra loves him and then is like a devil ,you don't know it's his real personality from first or cuz of stress after heart transplant or cuz of greed and many things else... if it wasn't for ji hwan and character Ji na I had dropped it in the middle!! michel Jun 11 2014 4:21 am Jung so min you are so pretty and cute ,i love you so much . bi rain Jun 10 2014 9:37 pm I think jung so min make this drama haven more than good drama ,this girl so good at acting . Yen Lin Jun 09 2014 5:29 pm Jung so min i love this girl She just prefect girl .pretty and smart .She looks like My Barbarian Girl but 15 years younger. I think she will be the most successful actress. glyn Jun 08 2014 3:16 pm KANG JI-HWAN! you are so handsome! Thank you for starring in another great drama series! Kang Ji-Hwan is such a great actor. I enjoyed watching all the movies and drama series he's starred in. So happy he's starring in Big Man. looking forward to seeing what's next for him! love Jun 08 2014 1:17 pm Jung so min i love this girl She just prefect girl .pretty and smart . loveyou Jun 08 2014 1:15 pm I thing that so min shold be the lead actress She can acting good more than lee-da hee She also pretty girl . dadz Jun 06 2014 5:39 am hi kalo. . . .are you referring to jung so min . ... if you love her acting, you should try watching mischievous kiss/playful kiss and can we get married . . those two dramas were starred by jung so min .. .those were fun and grea t . . .
kalo Jun 05 2014 7:18 am I love the girl with rad hair ,she pretty .good acting skill,she prefect girl . gentlelily Jun 04 2014 3:28 am I hope the story will develop the love relationship between Jung So Min and Kang Ji Hwan as their chemistry is so naturally awesome. 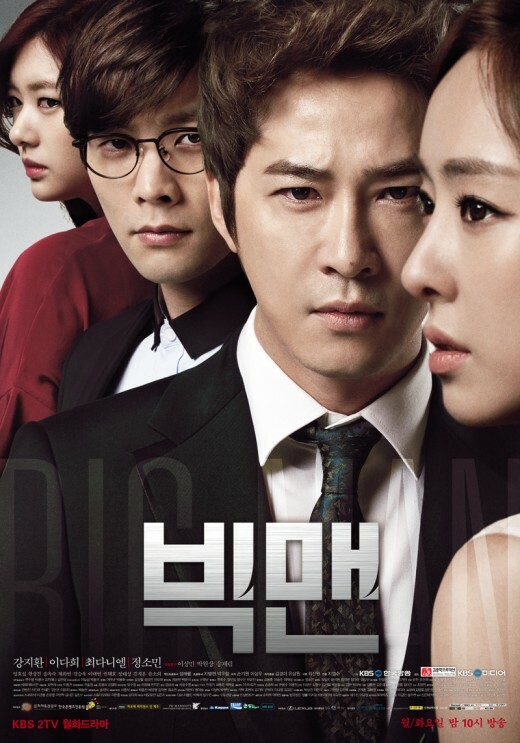 Kang Ji Hwan's role in Big Man should fall for Jina. ju May 30 2014 8:38 am Jung so min make this drama batter and batter. I love this girl ,she shold be the lead actress. She soo good in acting . hgx May 29 2014 5:57 pm Jung so min soo good actress . I love to see her in drama "big man "and she soo pretty and funny . Elise Palmario May 28 2014 9:49 am I really like how this drama goes. And I personally like Lee Da Hee because of the another hit drama "secret love" i'm already excited about this drama's climax and denoument. dinam May 24 2014 8:47 am Kang ji hwan, always my favourite! I always like his acting! Greenluvs May 24 2014 12:10 am @Timegoesby: I totally agree. I really like Lee Da Hee, and think she's doing well in her role. People complain that "Kang Jin Ah" is more spirited than "So Mi Ra," and therefore conclude Jung So Min is a better actress. They don't seem to factor in that this is the way the characters were written. Sadly, people were already predisposed to dislike Le Da Hee because of her previous roles, and because Jung So Min in "Oh Ha Ni" from Playful Kiss. may May 22 2014 6:26 am Its wired, the drama is good enough, why it got bad rating? Ellen May 21 2014 6:30 pm I am onto episode 3. Kang Ji Hwan, always my favourite actor. He is really good. The plot seems interesting. Yana May 19 2014 10:24 pm The good thing about this drama, in my opinion, are the characters. Ji hyuk is a ex-gangster, but he doesn't SEEM LIKE IT. He's too nice to be one! But, it's obviously there. The pain and anger that he had until he found his "family". You can just see how happy he is, and how he's trying to live as a better man. I feel so bad for him. Just wait till he knows the truth, it's gonna rage him. Mira. A black and white character with almost no other colors, but a female lead that I like. A secretary or an assistant who do her job well, but is not an important person in the company. She's the secret girlfriend of Dong Seok. At first it seems like she's in love with him, even willing to kill off Ji Hyuk to save him. But she later came care for Ji Hyuk and it constantly bothers her that she worries about him. Her feelings became hesitant for Dong Seok as she recognize that it was only an ideal, and that she never wanted to live in it. She's also the one who brings out the bright side of Ji Hyuk. Dong Seok is in a mental state when he returns after having a not-so-reliable-heart. He becomes different, and wants to live the way he wants to, yes in a bad way, that leads him to be possessive and scary. Jin Ah. The second female lead? She's quite bratty but she's probably the most humane person in the family of Dong Seok's. She have high interest in Ji hyuk and is attracted to him. Which makes her cute because you can see that she dislikes that he is supposedly her "brother". or_k May 15 2014 10:29 am I do have problem with characters,too and sometimes I can't understand them specially two main characters,but as an answer to "Join the conversation", ji-hyuk is not just a poor boy,he's an orphan that has lived her life with anger of having no family,you can see some kind of harshness in his manner(but is kind with people who have helped him). as the story says he knows prison's guards, maybe had been in jail several times and also he had been a member of trespasser group,so don't see him as a sample of poor people ,he has his own characteristics!!! ji hoon May 15 2014 12:12 am i love this drama. what bothering me right now. why korean drama there always about rich family issue . but still this drama has their own charm. and i love it. i love kang ji hwan character. Join the conversation May 14 2014 7:11 am Another drama about rich people problems. All of them with no substance,no character, shallow and hollow.Their sense of entitlement is atrocious but quite real within our society,it doesn't matter in which century you lived or are living,this is very real. Kim Ji-Hyeok may have been brought up poor, but there is no need to make him look like an animal with no table manners. Everytime they make a scene at the table and they have to eat, he eats like a total slob.It is disgusting. Poor people also have table manners,it's not exclusive to the almighty rich. I'm still trying to understand the relevance of the character Kang Jin-Ah in this story, she does or adds nothing to it. Hopefully she'll become an ally. Pam May 14 2014 5:33 am great , enjoyable drama , this drama is believable plots , KJW acting skill is excellent . other actors are good too . shshsh May 13 2014 7:45 am Liked from the first episode though I prefer Golden Cross to this. dramaaddict576 May 12 2014 6:23 pm This drama had a slow start. It has gotten better from episode 4. Blame the writers for the slow first episodes. Timegoesby May 09 2014 12:45 am there is nothing wrong with this drama the people below probably have extreme ADD/ADHD cause they are really exaggerating this drama its been only 4 episodes how can it receive all this negativity. 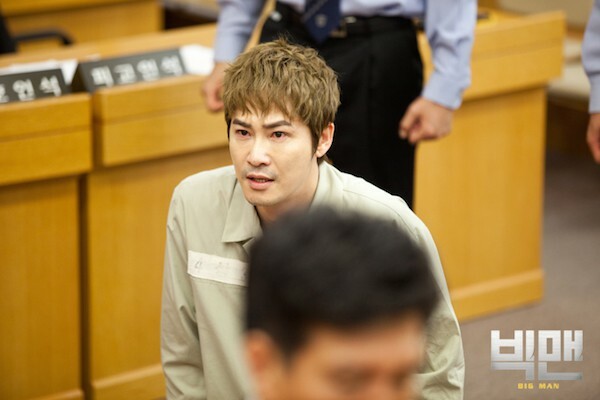 im looking forward to seeing how Kang ji hwan handles his fake dad cant wait big man cast hwaiting!! Jacq May 08 2014 12:56 am I'm a HUGE fan of Ji-Hwan. This drama has an interesting story but after watching epi 4 I'm so annoyed & bored w/the main actress Da-Hee. The writer is trying to show us the slow love build-up between the main leads but I see nothing between them(the bike ride & tie scene was a joke) They're not a good match...disappointed. But, I will continue to support this drama because of Ji-Hwan & So Min. orkideh May 06 2014 12:19 pm I decided to watch this drama because of KJH.but the story is not as good as i wished for.LDH doesn't seem to be a good couple or match for JH. but KJH and EHs(father) are good enough and i enjoy watching their act and their intraction,i keep watching it and hope the story gets better in next episods! klo May 06 2014 5:25 am Jung so min shold be the lead actress she know to act and she pretty. kim May 05 2014 3:24 am Jung so min shold be actress lead ,she pretty and good actress. Ann May 04 2014 1:38 pm This drama would be very interesting if the romance is with Kang Ji Hyun and Jung So Min. Hoping she'll be his love interest. But, so far I am liking this drama. wisa May 02 2014 9:24 pm Seems alright...not a bad drama so far. Lemonhead May 01 2014 11:02 pm Great drama. Love Kang Ji Hwan and Jung So Min together. Kaylee May 01 2014 6:57 pm Watched 2 episodes and its got me hooked already. One reason Ji Hwan and So Min. I hope the story builds on their relationship. It's so much more interesting watching Ji Hwan & So Min rather than Da-Hee. Hoping this drama continues to capture my interest. BIG MAN FIGHTING!!! Greenluvs May 01 2014 1:37 pm I know there are a lot of Playful Kiss and Secret fans here, but I really hope that Lee Da Hee stays as the lead. Jung So Min is cute, but I prefer LDH with Kang Ji Hwan. Happy to see her in a main lead role and paired up with him. Jacq May 01 2014 12:50 am So far this drama is good. Kang Ji-Hwan as always is great...but I think the lead actress Da-Hee is so bland...I find her character to be very boring and I don't see the chemistry between them. I do love the chemistry between Ji-Hwan & So Min...they definitely need more screen time because all of there scenes together were exciting & not boring. Hopefully the writers will change his love interest to So Min. Looking forward to the next episode!!! Miro May 01 2014 12:17 am Kang Ji-Hwan and Lee Da-Hee are among my favorite actors, I like to play together. ?? Apr 30 2014 7:46 pm I love Lee Da-Hee , Daniel Choi and Kang Ji-Hwan !!!! leahe807 Apr 30 2014 1:27 pm I think jung so min is the best actress in this drama.she know to act,and she so cute and pretty more than lee da-hee. jules Apr 29 2014 10:39 am Jung So Min is not the lead? But I love her especially as Oh Ha Ni in Mischievous Kiss. Anyways, will still watch this because I'm a big fan of Kang Ji Hwan even though I don't like the lead actress on this drama. mimiya Apr 04 2014 7:38 pm Love Jung So-Min...wish she was the lead. jaypee Mar 24 2014 7:17 am great to see choi daniel again in this drama... oppa fighting!!! gigi Mar 08 2014 1:25 am hi kang ji hwan!!! I have just recently watched some of your previous rom-com series,and i'm totally captured to every role you are in...just keeps me wondering how's it kang ji hwan in real life.....oppa,oppa,oppa!!!! pipiet Mar 03 2014 9:47 am Jung so min FIGHTING!!!!! tamara Feb 28 2014 3:33 am Omg lee da hee! I really nevef imagined before that you offered the woman lead role n you accept it. Hwaiting eonni! You can do it :) do your best, I'm waiting it :) I'm curious what character will you potray in this drama. Protagonist or antagonist or ambiguities? lamees Feb 20 2014 7:05 am I love jung so min very much . kim hyun joong &jung so min is the best couble . JJ Feb 18 2014 1:13 pm i luv KJH i can't wait for this new drama! yday i was rewatching Kang in Be Strong Geum Soon & just adores him more! fighting! 679ygghfgfg Feb 13 2014 6:51 pm it would be great if the producer cast han ga in as the female lead and lee yeon hee as the supporting actress. Snowmers Feb 13 2014 5:30 pm Two of my favorite korean actors. Wow!...who will be the lucky girl to be in this drama?